What Does It Really Take to Get Back in Shape? It’s a familiar scenario: Your exercise routine was humming along smoothly until, suddenly, you got injured. Or sick. Or work demands piled up, leaving little to no space for your regular sweat session. Now that you’re ready to jump back in, you’re probably wondering how long it will take to regain your hard-earned fitness? According to Jacque Crockford, exercise physiologist for the American Council on Exercise, your journey back to fitness depends on several factors, including what type of exercise you’re doing, your history of physical activity, your age and how sedentary you were during your time off. That said, there are some general guidelines you can use as you begin your journey back to fitness. Here are four areas of your physical fitness that likely declined during your time off and what it takes to get them back. Believe it or not, taking just one week off from training will decrease your cardiac output (the amount of blood your heart pumps in one minute) by three to 10 percent. And that one week may set you back three weeks, says Michele Olson, Ph.D., professor of exercise science at Auburn University in Montgomery, Alabama. While you might be tempted to hit the ground running (literally) as soon as your vacation or recovery is over, Pete McCall, CSCS, ACE-certified personal trainer and host of the All About Fitness podcast, suggests dedicating at least four to six workouts (about two weeks) to building back to your previous cardio workout. Perform your first two to three workouts at half your usual mileage and intensity, then increase to three-quarters of your usual mileage and intensity for the following two to three workouts. Olson also recommends doing your activity in segments, as opposed to all at once. For example, if you normally run for 30 minutes, try breaking it up into two 12-minute segments your first week back. Use your recovery breaks to sneak in some dynamic stretching and an extra sip of water. When you give up exercise for a time, your muscular strength tends to stick around a little longer than your cardiovascular fitness. But after about two to four weeks of no training, your strength will begin to suffer because of decreases in neuromuscular efficiency (i.e., the brain-muscle connection), Olson says. After that, the muscle cells themselves begin to shrink. 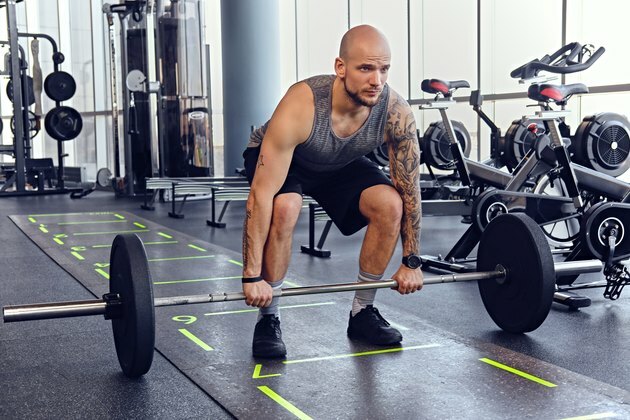 When you’re ready to hit the weight room again, use the first four to six sessions (about two weeks) to work back up to the weights you normally lift. McCall recommends using half of your usual weight for the first two to three workouts, and then increasing to three-quarters for the next two to three workouts. You can also progress by doing fewer reps or sets with your normal weight. For example, if you typically do three to four sets of lunges with 15-pound dumbbells, perform a warmup set with 12-pound dumbbells. Then perform two sets with the 15-pound weights, Olson says. Here’s some good news for yogis and mobility fanatics: Taking some time away from the mat or foam roller won’t set you back too far. It is likely you’ll be able to regain flexibility and mobility more quickly than endurance or strength simply because it involves a physical manipulation of tissue, as opposed to changes at the cellular level, Crockford says. Plus, your mobility and flexibility will return more readily if you were out and about during your time off. Once you’ve recovered from your illness or injury, begin incorporating brief, five- to 10-minute movement breaks into your day. At least once an hour, get up from your desk and take a walk, do some light stretching and rotate your hips in circles a few times in each direction. Ideally, you’ll be doing a bit of foam rolling every day, whether you did it before or not. Place extra focus on rolling out the front of your thighs, as these muscles can get tight from sitting for long periods of time, McCall says. Unlike all the other components of physical fitness, power is the very first thing to go and the very last thing to come back. In fact, a mere 10 days of inactivity will set you back four to eight weeks, McCall says. That’s because power is dependent on your nervous system’s ability to quickly recruit your muscles’ motor units. “A motor unit is like a spark plug in a muscle,” McCall says. “When a motor unit is contracted, it causes the muscle fibers to contract.” If you don’t keep your motor units active, they become slow to spark and your muscles take longer to contract. As power exercises like sprints, plyometrics and Olympic lifts place a lot of stress on your body, you’ll want to be extremely patient and build back explosiveness slowly to reduce the likelihood of injury. McCall recommends cutting your normal workload in half for your first three to four weeks back in the saddle. Then increase to three-quarters of your normal workload for the next two to four weeks. Limit power training to a maximum of two days per week. A good way to gauge if you’re ready is to notice if you’re in pain or simply uncomfortable. “Exercise is supposed to be a little uncomfortable,” McCall says, “but it shouldn’t cause pain.” If you feel a sharp, acute pain during exercise — or even if something just doesn’t feel “right” — your body is telling you to stop. Listen to those signals and take it easy for another week or two. Have you recently taken a break from your workouts? Are you working on getting back in shape? What’s the hardest part? We’re you surprised by how long some things take to get back? Share your stories and questions in the comments below!